New Vrindavana has The Festival of Inspiration, New Hastinapura has the Dushera Festival, Atlanta has The Panihati Festival , New York has the biggest Ratha Yatra on the East Coast, and we, my dear devotees have the delightfully benevolent presence of Sri Sri Radha-Damodara, the cows, (and cowherd boys and girls. . . ) and Govardhana Hill. What a perfect combination for Gita Nagari's signature festival Govardhana Puja. That sublime opportunity to really relish the pastimes of the residents of Vraja by re-enacting the decoration and worship of the cows at the Goshalla in the company of Sri Sri Radha-Damodara, reciting the Damodarastakam prayers under Their watchful eyes and dancing ecstatically around Krishna in His MOST attractive form as a Hill of Sweets! 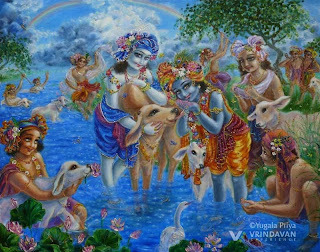 Jaya Giri Govardhana! Let's come together in gratitude for the opportunity to have this Holy Dhama in our lives, let's spread the word and bring not just ourselves but our friends and neighbours to join in the fun with us. 8.30am Greeting the dieties in their new outfit. 9.00am Prepare Their Lordships for procession to the Goshalla. 9.30am Decorating, feeding the cows and arati for their Lordships. 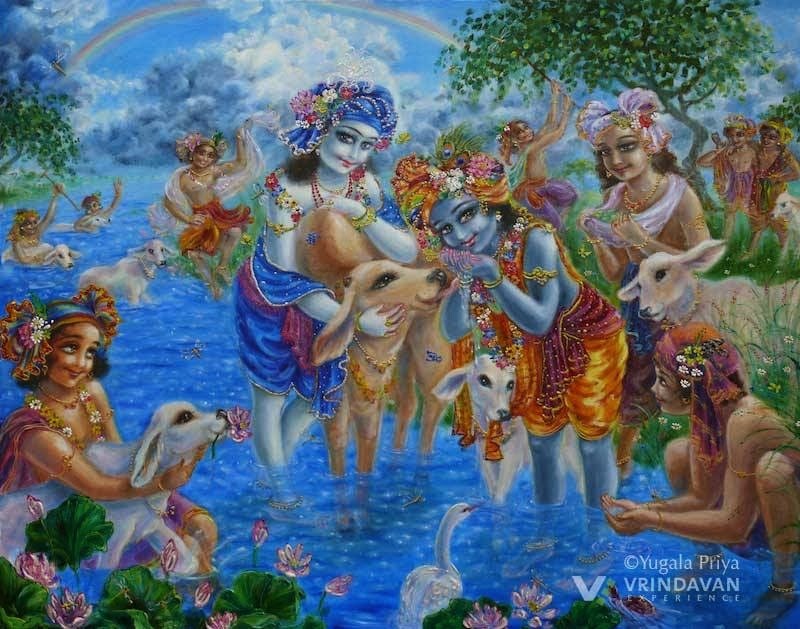 12 noon Arati to their Lordships Sri Sri Radha-Damodara. 2.30-3.00pm Singing of Damodarastakam offering of lamps. 3.00-4.00pm Drama: The lifting of Govardhana Hill by the Gita Nagari Players. 5.30pm Feast and distribution of the sweets.